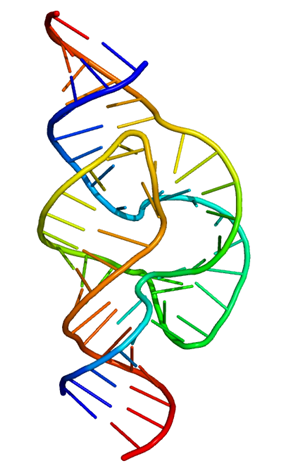 Ribonucleic acid (RNA) is a polymeric molecule. It is implicated in a varied sort of biological roles in messenger RNA (mRNA) to convey genetic information (using the letters G, A, U, and C to denote the nitrogenous bases guanine, adenine, uracil and cytosine) that directs synthesis of specific proteins. Many viruses encode their genetic information using an RNA genome. Some RNA molecules play an active role within cells by catalyzing biological reactions, controlling gene expression, or sensing and communicating responses to cellular signals. One of these active processes is protein synthesis, a universal function whereby mRNA molecules direct the assembly of proteins on ribosomes. This process uses transfer RNA (tRNA) molecules to deliver amino acids to the ribosome, where ribosomal RNA (rRNA) links amino acids together to form proteins. Bases in an RNA molecule. Three-dimensional representation of the 50S ribosomal subunit. RNA is in ochre, protein in blue. The active site is in the middle (red). Like DNA, most biologically active RNAs, including mRNA, tRNA, rRNA, snRNAs, and other non-coding RNAs, contain self-complementary sequences that allow parts of the RNA to fold and pair with itself to form double helices. Analysis of these RNAs has revealed that they are highly structured. Unlike DNA, their structures do not consist of long double helices but rather collections of short helices packed together into structures akin to proteins. In this fashion, RNAs can achieve chemical catalysis, like enzymes. For instance, determination of the structure of the ribosome—an enzyme that catalyzes peptide bond formation—revealed that its active site is composed entirely of RNA. 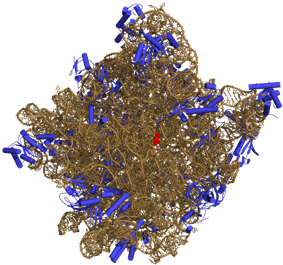 Each nucleotide in RNA contains a ribose sugar, with carbons numbered 1' through 5'. 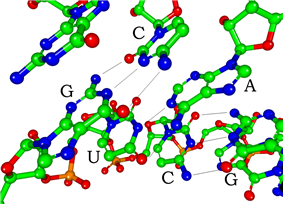 A base is attached to the 1' position, in general, adenine (A), cytosine (C), guanine (G), or uracil (U). Adenine and guanine are purines, cytosine and uracil are pyrimidines. A phosphate group is attached to the 3' position of one ribose and the 5' position of the next. The phosphate groups have a negative charge each at physiological pH, making RNA a charged molecule (polyanion). The bases form hydrogen bonds between cytosine and guanine, between adenine and uracil and between guanine and uracil. However, other interactions are possible, such as a group of adenine bases binding to each other in a bulge, or the GNRA tetraloop that has a guanine–adenine base-pair. An important structural feature of RNA that distinguishes it from DNA is the presence of a hydroxyl group at the 2' position of the ribose sugar. The presence of this functional group causes the helix to adopt the A-form geometry rather than the B-form most commonly observed in DNA. This results in a very deep and narrow major groove and a shallow and wide minor groove. A second consequence of the presence of the 2'-hydroxyl group is that in conformationally flexible regions of an RNA molecule (that is, not involved in formation of a double helix), it can chemically attack the adjacent phosphodiester bond to cleave the backbone. There are more than 100 other naturally occurring modified nucleosides, The greatest structural diversity of modifications can be found in tRNA, while pseudouridine and nucleosides with 2'-O-methylribose often present in rRNA are the most common. The specific roles of many of these modifications in RNA are not fully understood. However, it is notable that, in ribosomal RNA, many of the post-transcriptional modifications occur in highly functional regions, such as the peptidyl transferase center and the subunit interface, implying that they are important for normal function. EteRNA a game forming RNA by pairing bases. ^ a b c Berg JM, Tymoczko JL, Stryer L (2002). Biochemistry (5th ed.). WH Freeman and Company. pp. 118–19, 781–808. ^ I. Tinoco and C. Bustamante (1999). "How RNA folds". J. Mol. Biol. 293 (2): 271–281. ^ Higgs PG (2000). "RNA secondary structure: physical and computational aspects". Quarterly Reviews of Biophysics 33 (3): 199–253. ^ a b Nissen P, Hansen J, Ban N, Moore PB, Steitz TA; Hansen; Ban; Moore; Steitz (2000). "The structural basis of ribosome activity in peptide bond synthesis". Science 289 (5481): 920–30. ^ a b Lee JC, Gutell RR; Gutell (2004). "Diversity of base-pair conformations and their occurrence in rRNA structure and RNA structural motifs". J. Mol. Biol. 344 (5): 1225–49. ^ Barciszewski J, Frederic B, Clark C (1999). RNA biochemistry and biotechnology. Springer. pp. 73–87. ^ Salazar M, Fedoroff OY, Miller JM, Ribeiro NS, Reid BR; Fedoroff; Miller; Ribeiro; Reid (1992). "The DNA strand in DNAoRNA hybrid duplexes is neither B-form nor A-form in solution". Biochemistry 32 (16): 4207–15. ^ Hermann T, Patel DJ; Patel (2000). "RNA bulges as architectural and recognition motifs". Structure 8 (3): R47–R54. ^ Mikkola S, Nurmi K, Yousefi-Salakdeh E, Strömberg R, Lönnberg H; Stenman; Nurmi; Yousefi-Salakdeh; Strömberg; Lönnberg (1999). "The mechanism of the metal ion promoted cleavage of RNA phosphodiester bonds involves a general acid catalysis by the metal aquo ion on the departure of the leaving group". Perkin transactions 2 (8): 1619–26. ^ Jankowski JAZ, Polak JM (1996). Clinical gene analysis and manipulation: Tools, techniques and troubleshooting. Cambridge University Press. p. 14. ^ Yu Q, Morrow CD; Morrow (2001). "Identification of critical elements in the tRNA acceptor stem and TΨC loop necessary for human immunodeficiency virus type 1 infectivity". J Virol. 75 (10): 4902–6. ^ Elliott MS, Trewyn RW; Trewyn (1983). "Inosine biosynthesis in transfer RNA by an enzymatic insertion of hypoxanthine". J. Biol. Chem. 259 (4): 2407–10. ^ Cantara, WA; Crain, PF; Rozenski, J; McCloskey, JA; Harris, KA; Zhang, X; Vendeix, FA; Fabris, D; Agris, PF (January 2011). "The RNA Modification Database, RNAMDB: 2011 update". Nucleic Acids Research 39 (Database issue): D195–201. ^ Söll D, RajBhandary U (1995). TRNA: Structure, biosynthesis, and function. ASM Press. p. 165. ^ Kiss T (2001). "Small nucleolar RNA-guided post-transcriptional modification of cellular RNAs". The EMBO Journal 20 (14): 3617–22. ^ King TH, Liu B, McCully RR, Fournier MJ; Liu; McCully; Fournier (2002). "Ribosome structure and activity are altered in cells lacking snoRNPs that form pseudouridines in the peptidyl transferase center". Molecular Cell 11 (2): 425–35. ^ Mathews DH, Disney MD, Childs JL, Schroeder SJ, Zuker M, Turner DH; Disney; Childs; Schroeder; Zuker; Turner (2004). "Incorporating chemical modification constraints into a dynamic programming algorithm for prediction of RNA secondary structure". Proc. Natl. Acad. Sci. USA 101 (19): 7287–92. ^ Tan ZJ, Chen SJ; Chen (2008). "Salt dependence of nucleic acid hairpin stability". Biophys. J. 95 (2): 738–52. ^ Nudler E, Gottesman ME; Gottesman (2002). "Transcription termination and anti-termination in E. coli". Genes to Cells 7 (8): 755–68. ^ Jeffrey L Hansen, Alexander M Long, Steve C Schultz; Long; Schultz (1997). "Structure of the RNA-dependent RNA polymerase of poliovirus". Structure 5 (8): 1109–22. ^ Ahlquist P (2002). "RNA-Dependent RNA Polymerases, Viruses, and RNA Silencing". Science 296 (5571): 1270–73. ^ a b c Cooper GC, Hausman RE (2004). The Cell: A Molecular Approach (3rd ed.). Sinauer. pp. 261–76, 297, 339–44. ^ Mattick JS, Gagen MJ; Gagen (1 September 2001). "The evolution of controlled multitasked gene networks: the role of introns and other noncoding RNAs in the development of complex organisms". Mol. Biol. Evol. 18 (9): 1611–30. ^ Mattick, JS (2001). "Noncoding RNAs: the architects of eukaryotic complexity". EMBO Reports 2 (11): 986–91. ^ Mattick JS (October 2003). "Challenging the dogma: the hidden layer of non-protein-coding RNAs in complex organisms". BioEssays : News and Reviews in Molecular, Cellular and Developmental Biology 25 (10): 930–9. ^ Mattick JS (October 2004). "The hidden genetic program of complex organisms". Scientific American 291 (4): 60–7. ^ a b c Wirta W (2006). Mining the transcriptome – methods and applications. Stockholm: School of Biotechnology, Royal Institute of Technology. ^ Rossi JJ (2004). "Ribozyme diagnostics comes of age". Chemistry & Biology 11 (7): 894–95. ^ Gueneau de Novoa P, Williams KP; Williams (2004). "The tmRNA website: reductive evolution of tmRNA in plastids and other endosymbionts". Nucleic Acids Res. 32 (Database issue): D104–8. ^ Wu L, Belasco JG; Belasco (January 2008). "Let me count the ways: mechanisms of gene regulation by miRNAs and siRNAs". Mol. Cell 29 (1): 1–7. ^ Matzke MA, Matzke AJM; Matzke (2004). "Planting the seeds of a new paradigm". PLoS Biology 2 (5): e133. ^ Vazquez F, Vaucheret H, Rajagopalan R, Lepers C, Gasciolli V, Mallory AC, Hilbert J, Bartel DP, Crété P; Vaucheret; Rajagopalan; Lepers; Gasciolli; Mallory; Hilbert; Bartel; Crété (2004). "Endogenous trans-acting siRNAs regulate the accumulation of Arabidopsis mRNAs". Molecular Cell 16 (1): 69–79. ^ Watanabe T, Totoki Y, Toyoda A et al. (May 2008). "Endogenous siRNAs from naturally formed dsRNAs regulate transcripts in mouse oocytes". Nature 453 (7194): 539–43. ^ Sontheimer EJ, Carthew RW; Carthew (July 2005). "Silence from within: endogenous siRNAs and miRNAs". Cell 122 (1): 9–12. ^ Doran G (2007). "RNAi – Is one suffix sufficient?". Journal of RNAi and Gene Silencing 3 (1): 217–19. ^ Pushparaj PN, Aarthi JJ, Kumar SD, Manikandan J; Aarthi; Kumar; Manikandan (2008). "RNAi and RNAa — The Yin and Yang of RNAome". Bioinformation 2 (6): 235–7. ^ Horwich MD, Li C Matranga C, Vagin V, Farley G, Wang P, Zamore PD; Li; Matranga; Vagin; Farley; Wang; Zamore (2007). "The Drosophila RNA methyltransferase, DmHen1, modifies germline piRNAs and single-stranded siRNAs in RISC". Current Biology 17 (14): 1265–72. ^ Girard A, Sachidanandam R, Hannon GJ, Carmell MA; Sachidanandam; Hannon; Carmell (2006). "A germline-specific class of small RNAs binds mammalian Piwi proteins". Nature 442 (7099): 199–202. ^ Horvath P, Barrangou R; Barrangou (2010). "CRISPR/Cas, the Immune System of Bacteria and Archaea". Science 327 (5962): 167–70. ^ Wagner EG, Altuvia S, Romby P; Altuvia; Romby (2002). "Antisense RNAs in bacteria and their genetic elements". Adv Genet. Advances in Genetics 46: 361–98. ^ Gilbert SF (2003). Developmental Biology (7th ed.). Sinauer. pp. 101–3. ^ Amaral PP, Mattick JS; Mattick (October 2008). "Noncoding RNA in development". Mammalian genome : official journal of the International Mammalian Genome Society 19 (7–8): 454–92. ^ Heard E, Mongelard F, Arnaud D, Chureau C, Vourc'h C, Avner P; Mongelard; Arnaud; Chureau; Vourc'h; Avner (1999). yeast artificial chromosome transgenes show partial X inactivation center function in mouse embryonic stem cells"XIST"Human . Proc. Natl. Acad. Sci. USA 96 (12): 6841–46. ^ Batey RT (2006). "Structures of regulatory elements in mRNAs". Curr. Opin. Struct. Biol. 16 (3): 299–306. ^ Scotto L, Assoian RK; Assoian (June 1993). "A GC-rich domain with bifunctional effects on mRNA and protein levels: implications for control of transforming growth factor beta 1 expression". Mol. Cell. Biol. 13 (6): 3588–97. ^ Steitz TA, Steitz JA; Steitz (1993). "A general two-metal-ion mechanism for catalytic RNA". Proc. Natl. Acad. Sci. U.S.A. 90 (14): 6498–502. ^ Xie J, Zhang M, Zhou T, Hua X, Tang L, Wu W; Zhang; Zhou; Hua; Tang; Wu (2007). "Sno/scaRNAbase: a curated database for small nucleolar RNAs and cajal body-specific RNAs". Nucleic Acids Res. 35 (Database issue): D183–7. ^ Omer AD, Ziesche S, Decatur WA, Fournier MJ, Dennis PP; Ziesche; Decatur; Fournier; Dennis (2003). "RNA-modifying machines in archaea". Molecular Microbiology 48 (3): 617–29. ^ Cavaillé J, Nicoloso M, Bachellerie JP; Nicoloso; Bachellerie (1996). "Targeted ribose methylation of RNA in vivo directed by tailored antisense RNA guides". Nature 383 (6602): 732–5. ^ Kiss-László Z, Henry Y, Bachellerie JP, Caizergues-Ferrer M, Kiss T; Henry; Bachellerie; Caizergues-Ferrer; Kiss (1996). "Site-specific ribose methylation of preribosomal RNA: a novel function for small nucleolar RNAs". Cell 85 (7): 1077–88. ^ Daròs JA, Elena SF, Flores R; Elena; Flores (2006). "Viroids: an Ariadne's thread into the RNA labyrinth". EMBO Rep. 7 (6): 593–8. ^ Kalendar R, Vicient CM, Peleg O, Anamthawat-Jonsson K, Bolshoy A, Schulman AH; Vicient; Peleg; Anamthawat-Jonsson; Bolshoy; Schulman (2004). "Large retrotransposon derivatives: abundant, conserved but nonautonomous retroelements of barley and related genomes". Genetics 166 (3): 1437–50. ^ Podlevsky JD, Bley CJ, Omana RV, Qi X, Chen JJ; Bley; Omana; Qi; Chen (2008). 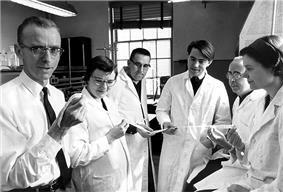 "The telomerase database". Nucleic Acids Res. 36 (Database issue): D339–43. ^ Blevins T et al. (2006). "Four plant Dicers mediate viral small RNA biogenesis and DNA virus induced silencing". Nucleic Acids Res 34 (21): 6233–46. ^ Jana S, Chakraborty C, Nandi S, Deb JK; Chakraborty; Nandi; Deb (2004). "RNA interference: potential therapeutic targets". Appl. Microbiol. Biotechnol. 65 (6): 649–57. ^ Schultz U, Kaspers B, Staeheli P; Kaspers; Staeheli (2004). "The interferon system of non-mammalian vertebrates". Dev. Comp. Immunol. 28 (5): 499–508. ^ Whitehead, K. A.; Dahlman, J. E.; Langer, R. S.; Anderson, D. G. (2011). "Silencing or Stimulation? SiRNA Delivery and the Immune System". Annual Review of Chemical and Biomolecular Engineering 2: 77–96. ^ Dahm R (2005). "Friedrich Miescher and the discovery of DNA". Developmental Biology 278 (2): 274–88. ^ Caspersson T, Schultz J; Schultz (1939). "Pentose nucleotides in the cytoplasm of growing tissues". Nature 143 (3623): 602–3. ^ Ochoa S (1959). "Enzymatic synthesis of ribonucleic acid". Nobel Lecture. ^ Rich A, Davies, D; Davies (1956). "A New Two-Stranded Helical Structure: Polyadenylic Acid and Polyuridylic Acid". Journal of the American Chemical Society 78 (14): 3548. ^ Holley RW et al. (1965). "Structure of a ribonucleic acid". Science 147 (3664): 1462–65. ^ Siebert S (2006). "Common sequence structure properties and stable regions in RNA secondary structures". Dissertation, Albert-Ludwigs-Universität, Freiburg im Breisgau. p. 1. ^ Szathmáry E (1999). "The origin of the genetic code: amino acids as cofactors in an RNA world". Trends Genet. 15 (6): 223–9. ^ Fiers W et al. (1976). "Complete nucleotide-sequence of bacteriophage MS2-RNA: primary and secondary structure of replicase gene". Nature 260 (5551): 500–7. ^ Napoli C, Lemieux C, Jorgensen R; Lemieux; Jorgensen (1990). "Introduction of a chimeric chalcone synthase gene into petunia results in reversible co-suppression of homologous genes in trans". Plant Cell 2 (4): 279–89. ^ Dafny-Yelin M, Chung SM, Frankman EL, Tzfira T; Chung; Frankman; Tzfira (December 2007). "pSAT RNA interference vectors: a modular series for multiple gene down-regulation in plants". Plant Physiol. 145 (4): 1272–81. ^ Ruvkun G (2001). "Glimpses of a tiny RNA world". Science 294 (5543): 797–99. ^ Fichou Y, Férec C; Férec (2006). "The potential of oligonucleotides for therapeutic applications". Trends in Biotechnology 24 (12): 563–70. At about the same time, 22 nt long RNAs, now called microRNAs, were found to have a role in the development of C. elegans. Studies on RNA interference gleaned a Nobel Prize for Andrew Fire and Craig Mello in 2006, and another Nobel was awarded for studies on transcription of RNA to Roger Kornberg in the same year. The discovery of gene regulatory RNAs has led to attempts to develop drugs made of RNA, such as siRNA, to silence genes. In 1977, introns and RNA splicing were discovered in both mammalian viruses and in cellular genes, resulting in a 1993 Nobel to Philip Sharp and Richard Roberts. Catalytic RNA molecules (ribozymes) were discovered in the early 1980s, leading to a 1989 Nobel award to Thomas Cech and Sidney Altman. In 1990 it was found in Petunia that introduced genes can silence similar genes of the plant's own, now known to be a result of RNA interference. During the early 1970s retroviruses and reverse transcriptase were discovered, showing for the first time that enzymes could copy RNA into DNA (the opposite of the usual route for transmission of genetic information). For this work, David Baltimore, Renato Dulbecco and Howard Temin were awarded a Nobel Prize in 1975. In 1976, Walter Fiers and his team determined the first complete nucleotide sequence of an RNA virus genome, that of bacteriophage MS2. The sequence of the 77 nucleotides of a yeast tRNA was found by Robert W. Holley in 1965, winning Holley the 1968 Nobel Prize in Medicine (shared with Har Gobind Khorana and Marshall Nirenberg). In 1967, Carl Woese hypothesized that RNA might be catalytic and suggested that the earliest forms of life (self-replicating molecules) could have relied on RNA both to carry genetic information and to catalyze biochemical reactions—an RNA world. 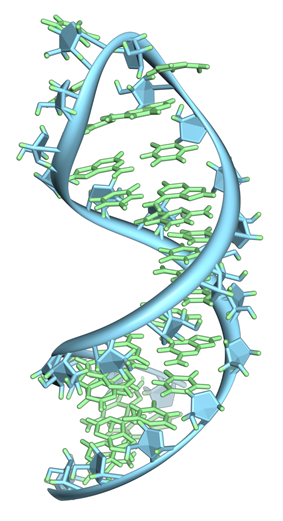 Double-stranded RNA (dsRNA) is RNA with two complementary strands, similar to the DNA found in all cells. dsRNA forms the genetic material of some viruses (double-stranded RNA viruses). Double-stranded RNA such as viral RNA or siRNA can trigger RNA interference in eukaryotes, as well as interferon response in vertebrates. Many RNAs are involved in modifying other RNAs. Introns are spliced out of pre-mRNA by spliceosomes, which contain several small nuclear RNAs (snRNA), or the introns can be ribozymes that are spliced by themselves. RNA can also be altered by having its nucleotides modified to other nucleotides than A, C, G and U. In eukaryotes, modifications of RNA nucleotides are in general directed by small nucleolar RNAs (snoRNA; 60-300 nt), found in the nucleolus and cajal bodies. snoRNAs associate with enzymes and guide them to a spot on an RNA by basepairing to that RNA. These enzymes then perform the nucleotide modification. rRNAs and tRNAs are extensively modified, but snRNAs and mRNAs can also be the target of base modification. RNA can also be methylated. Uridine to pseudouridine is a common RNA modification. While small interfering RNAs (siRNA; 20-25 nt) are often produced by breakdown of viral RNA, there are also endogenous sources of siRNAs. siRNAs act through RNA interference in a fashion similar to miRNAs. Some miRNAs and siRNAs can cause genes they target to be methylated, thereby decreasing or increasing transcription of those genes. Animals have Piwi-interacting RNAs (piRNA; 29-30 nt) that are active in germline cells and are thought to be a defense against transposons and play a role in gametogenesis. Several types of RNA can downregulate gene expression by being complementary to a part of an mRNA or a gene's DNA. MicroRNAs (miRNA; 21-22 nt) are found in eukaryotes and act through RNA interference (RNAi), where an effector complex of miRNA and enzymes can cleave complementary mRNA, block the mRNA from being translated, or accelerate its degradation. Messenger RNA (mRNA) carries information about a protein sequence to the ribosomes, the protein synthesis factories in the cell. It is coded so that every three nucleotides (a codon) correspond to one amino acid. In eukaryotic cells, once precursor mRNA (pre-mRNA) has been transcribed from DNA, it is processed to mature mRNA. This removes its introns—non-coding sections of the pre-mRNA. The mRNA is then exported from the nucleus to the cytoplasm, where it is bound to ribosomes and translated into its corresponding protein form with the help of tRNA. In prokaryotic cells, which do not have nucleus and cytoplasm compartments, mRNA can bind to ribosomes while it is being transcribed from DNA. After a certain amount of time the message degrades into its component nucleotides with the assistance of ribonucleases. Messenger RNA (mRNA) is the RNA that carries information from DNA to the ribosome, the sites of protein synthesis (translation) in the cell. The coding sequence of the mRNA determines the amino acid sequence in the protein that is produced. Many RNAs do not code for protein however (about 97% of the transcriptional output is non-protein-coding in eukaryotes ).